“Techung: Bone of the Heart” is a documentary about the role of music in the Tibetan freedom struggle and the mission of one man to keep it alive. The phrase “bone of the heart” is a Tibetan saying that refers to one’s courage. Techung must summon all of his heart-his courage-to keep his threatened culture alive through traditional Tibetan music. This film is a cinematic exploration of culture and identity in diaspora as reflected through preservation of Tibetan music . 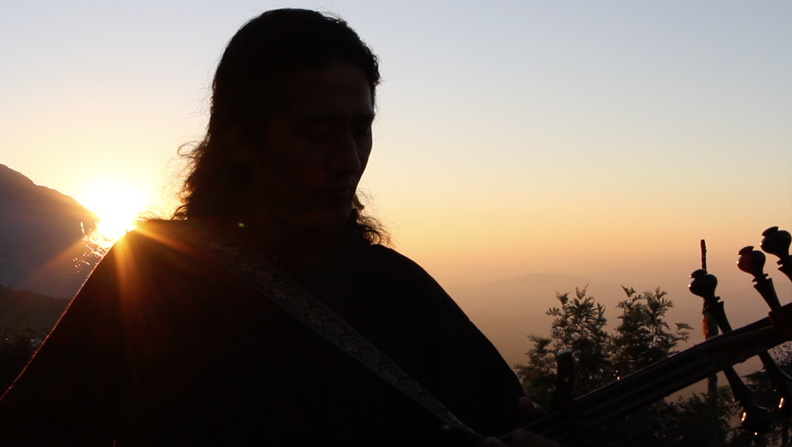 Our film emphasizes, through contemporary and traditional performance footage, interviews, intimate verite footage and archival film and photos, how the music of Tibet reflects the profound influence of Tibetan culture, Tibetan Buddhism and spiritual values on Tibetan identity and culture. Our film explores how cultural repression in Tibet puts immense pressure on Tibetans in exile to keep their threatened cultural identity, language and heritage alive through the language of music. We will also examine the tensions Tibetans in diaspora between traditional culture and modern society and how music may bridge that gap, as seen in the work of of exiled singer/songwriter Techung, whose life journey embodies these tensions. Since China invaded Tibet in 1950, this centuries old culture has been under threat.The Tibetan people have resisted efforts to eradicate their religion, language and artistic expression but with limited success. In 1959 Tibetans in Tibet rose up against the Chinese only to be crushed in defeat. The Dalai Lama escaped to India as did tens of thousands of his followers. Today life in Tibet is harsh and tensions are escalating. Artists who express a desire for freedom are often jailed, including 12 musicians in recent years who sang about freedom and their desire for the Dalai Lama to return to Tibet. Artists in exile such as Techung feel a deep responsibility to keep the culture alive in any way that they can. However, this is not always easy since in exile they are subjected to the popular culture which can also influence them. As one of the few musical artists in exile who are working to save Tibetan traditional music, Techung faces many challenges, though his motto is to “never give up”. The audience includes a cross section of men, women and young adults from the ages of 18 to 80 in the U.S. and abroad. We will target under served audiences of Tibetans and other immigrant and refugee groups in the U.S. and abroad whose experiences are rarely reflected in mass media and young people,educators, community leaders and faith based groups, through a proactive outreach campaign with community screenings across the U.S. and abroad as well as possible broadcast and educational distribution.